In 1973, the first homes in Oakwood were built and the Oakwood Homeowners Association (OHA) was created. Oakwood is now fully developed with 459 homes. The OHA was established and is empowered by the Oakwood Declaration of Covenants, Conditions and Restrictions which is recorded as a deed restriction on each and every lot in the Oakwood subdivision. Every person who buys a home in Oakwood is an automatic and compulsory member of the OHA. Your participation in the OHA will help the community and enable you to realize and enjoy the many benefits of living in Oakwood and the Westmont community. As stated in the Association's Articles of Incorporation, "the specific and primary purposes for which the Oakwood Homeowners Association (OHA) was formed are to provide for the maintenance, preservation, and control of the common areas... and to promote the health, safety, and welfare of the persons lawfully using said common areas." The OHA is managed by a board of three to seven unpaid volunteer directors who are elected by the OHA members for alternate two-year terms. The OHA is required to convene an Annual Meeting in a public forum to review and conduct the business of the association. The Annual Meeting, usually held in April, is a review and discussion of past and planned events, the results of the financial audit and review, and the current budget. In addition, the members of the Board of Directors are elected at this meeting. The OHA is responsible for maintaining all common areas including the Ogden Avenue entrance, the 35th Street entrance, the dry bottom storm water detention ponds near the 35th Street entrance, the Westman Beach area, the Eastern Shoreline area, and Lake Charles. Each homeowner shares in the responsibilities and operation of the OHA by paying an annual dues assessment. All OHA members may use Westman Beach, Lake Charles, and the Eastern Shoreline. Westman Beach and Lake Charles are accessed off Baltimore Avenue on the southeastern side of the lake. The Eastern Shoreline is also accessed off Baltimore Avenue except that the entry is at the extreme end of Baltimore by a path between the last home (lot #34) and the retaining wall of the industrial park. The OHA sponsors, supports, and/or encourages various social functions throughout the year. These have included a Children's Easter Egg Hunt, the June subdivision-wide Garage Sale,the fishing derby /Beach Party, the end of the summer BBQ, Halloween and Holiday kids parties. All members and tenants are encouraged to participate in planning and organizing as well as attending these events. Information on upcoming events is available through the quarterly Oak Leaf newsletter, the distribution email list and Facebook. 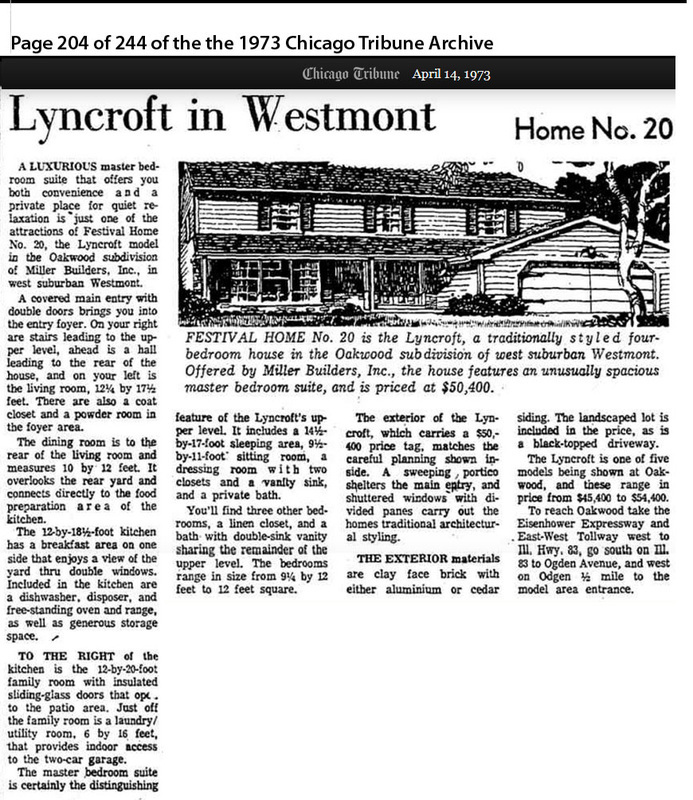 Just as a bit of trivia did you know one of the more popular home styles in Oakwood I was the Lyncroft, It sold brand new in 1973 for $50,400.